Bose QuietComfort 35 II wireless headphones now support Alexa | What Hi-Fi? Amazon’s voice assistant now sits alongside Google’s in these five-star noise-cancelling cans. The QuietComfort 35 II over-ears – the most recent model in Bose’s wildly successful line of QuietComfort noise-cancelling headphones – launched last year with a dedicated button to activate Google Assistant. It added welcome smart ingredient to an already successful five-star recipe - owners are use their voice to play music, ask questions or read their smartphone’s notifications. Amazon Alexa – the other big player in the voice control world – has long been promised to sit beside Assistant in the headphones. And it seems Bose has finally delivered. 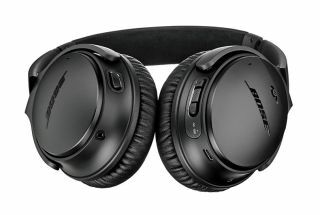 Users need to update their headphones’ software via the Bose Connect app to enable Alexa functionality, as well as pair the headphones within the Alexa app. Then just press the QuietComfort 35 II’s 'Action' button and vocalise a command - just as they would using Google Assistant. Bose QuietComfort 35 II vs Bowers & Wilkins PX vs Sony WH-1000XM2 - which are best?